We urgently need people to email Scope over the next 2 or 3 days to let them know in no uncertain terms what a disaster the closing of the ILF (Independent Living Fund) will be and that their attitude not to oppose this as they don’t have enough money to campaign on everything is unacceptable. 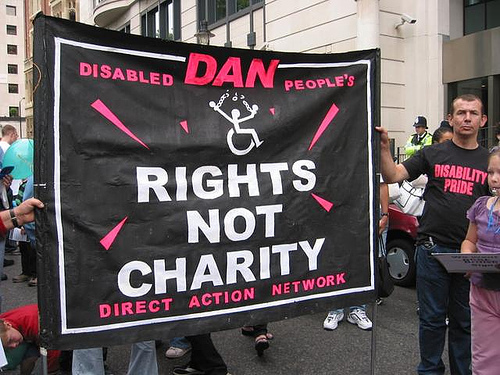 Also we need Scope to be made aware their own inaction in not campaigning with regards to the ILF closure is totally unacceptable from a major Charity who claim to be at all interested in the rights of disabled people. (apologies if this makes you all fall around laughing). A representative from Scope is meeting with Government this week to speak for you – so can you email Scope on the contact below to let them know exactly what you think of them and what you expect them to say for you. Be as brief or detailed as you want, but don’t allow SCOPE to sell disabled people out yet again.